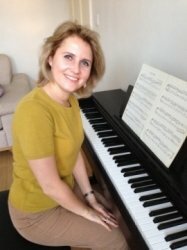 I am an enthusiastic, an experienced, classically trained and qualified piano teacher from London. I love to play music and share my knowledge with my pupils. I have a bachelor`s degree and a PhD in music. I work in central areas such as Holland Park, Bayswater, Notting Hill Gate,South Kensington and Hyde Park as well as Wimbledon and other areas local to me. As a qualified music teacher I have been teaching music in schools, colleges and kindergartens for 16 years and enjoy working with children and adults alike. I can teach music to children from 2 years old. I am very happy to teach children and adults to play the piano. I can do one-to-one tutoring or running lessons and workshops for groups. I think the piano is a wonderful music instrument and anybody can learn at any age. I started to play piano when I was 6 years old and I am really happy to carry on as a piano teacher to share my knowledge with my pupils. I teach beginner to intermediate,and to children and adults of all ages (from 2 years old children can start general music education). I also teach music to SEN pupils as well as I believe it helps them immensely. I choose a suitable and interesting music program for my pupils, whether pupils would like to learn classical piano, contemporary songs or popular music. I would be happy to teach what my students will be happy to play adjusting the complexity to suit student’s ability. I am an enthusiastic and patient teacher so I always motivate and encourage my students to achieve more goals in playing piano. My approach helps my pupils to improve their skills and really enjoy playing the piano! I am available to tutor in the afternoons and evenings all weekdays. You are welcome to my lessons! AnastasiaFrom Tina (5/5): Anastasia had been a wonderfully creative, entertaining and and attentive teacher to my five year old. She is a very positive person always with a big smile one her face and has a rather upbeat approach to piano classes. I find that very refreshing when it comes learning piano, often a rather tedious task for young children. Very happy with Anastasia. Reply from: Anastasia: Tina, thank you very much for your feedback. I am really glad to teach your daughter! Reply from: Anastasia: Dear Louise, thank you very much for your nice positive feedback! I am glad to teach your boyfriend! AnastasiaFrom Toni (5/5): As a beginner I was quite nervous at first, but Anastasia was so patient and after just two lessons I already saw an improvement in my music theory knowledge and my playing capability. She has a ton of experience in teaching music which comes across in her teaching method, she also has quite creative and effective teaching tools that she uses which makes her lessons a joy. I am very pleased with her as a teacher and will continue to do lessons with her as I am confident after several lessons under her guidance I will become a good pianist! Reply from: Anastasia: Dear Toni, It is a pleasure to teach such a keen and enthusiastic pupil. Thank you for your kind feedback! AnastasiaFrom Evie (5/5): Anastasia has been excellent and in a few lessons has managed to transfer her love for piano. She is Methodical and responsive to your requests and child’s needs. Definitely recommended! Reply from: Anastasia: Dear Evie, thank you very much for the nice feedback. I enjoy teaching your son. He makes good progress. AnastasiaFrom Tymur (5/5): Very good first teacher for my 6yo. Reply from: Anastasia: Thank you Timur for your nice comment. I am glad to teach your daughter. AnastasiaFrom Marie (5/5): Anastasia is an enthusiastic and upbeat piano teacher who clearly loves what she does and passes that love on to my son. He has only just turned 4 years old and so focussing on one thing is not his strongest attribute but Anastasia has the ability to hold his attention and keep him enjoying his music through the class. He is very fond of Anastasia and looks forward to his classes. I would highly recommend her! Reply from: Anastasia: Dear Marie, I am really pleased to get such a nice little pupil as your son. He is a very bright and studious boy. As a teacher I am enjoying seeing him progress! AnastasiaFrom Matt (5/5): I am an adult learner doing beginner piano currently with Anastasia and she has been great! Helpful, interesting and I have thoroughly enjoyed her lessons! Reply from: Anastasia: Thanks Matt for your great feedback. I am enjoying our lessons and helping you to learn the piano! AnastasiaFrom Juliana (5/5): Anastasia is a wonderful teacher! Inspiring, dynamic and friendly! Reply from: Anastasia: Dear Anita, thank you very much for your feedback! I really enjoy to teach such clever and bright pupil as Juliana! AnastasiaFrom Sarah (5/5): Great teacher. Very friendly and encouraging. Reply from: Anastasia: Thanks a lot. I really happy teacher to have bright and talented pupils. AnastasiaFrom Catherine (5/5): Our daughter's first few lessons with Anastasia have been wonderful. Anastasia's positive approach means that our daughter is already much more engaged and enthusiastic about Piano than she was previously. We really feel like she'll make good progress with Anastasia. Thanks a lot for your feedback! It is a pleasure to teach your boys. They are very bright and pick up all my instructions straight away. AnastasiaFrom Ling (5/5): Anastasia is a great teacher and she is very patient with children. Reply from: Anastasia: Dear Ling! Thank you very much for your nice feedback. AnastasiaFrom Karthik (5/5): Anastasia is an excellent tutor and has wealth of knowledge in music. My Daughter was enrolled for piano lessons and she was very comfortable from day 1 of the class. She explains each beats and sounds with passion. Reply from: Anastasia: Dear Karthik! Thank you very much for your feedback. I was really happy to teach your bright nice daughter and share my knowledge. Thank you! AnastasiaFrom Yara (5/5): Anastasia is very professional and friendly. My son and daughter started beginners' piano lessons with her couple of weeks ago. They enjoy it so much and they've improved. I highly recommend her. Reply from: Anastasia: Dear Yara! Thank you very much for your positive feedback. What a lovely teaching time I have had with your studious children. Thank you!